If they benefit the people and at the same time save the environment from being further damaged, efforts to bring in investments into the state should be encouraged. In fact, we should always be on the lookout for opportunities such as one that's created by POIC Sabah Sdn Bhd (Palm oil industrial cluster). Yesterday, POIC Sabah Sdn signed a memorandum of understanding with Evolution Energy LLC of the United States that could translate into a RM500 million (about US$156 mil) investment to produce gasoline, diesel, aviation fuel and clean burning coal from oil palm fronds and trunks by 2015. 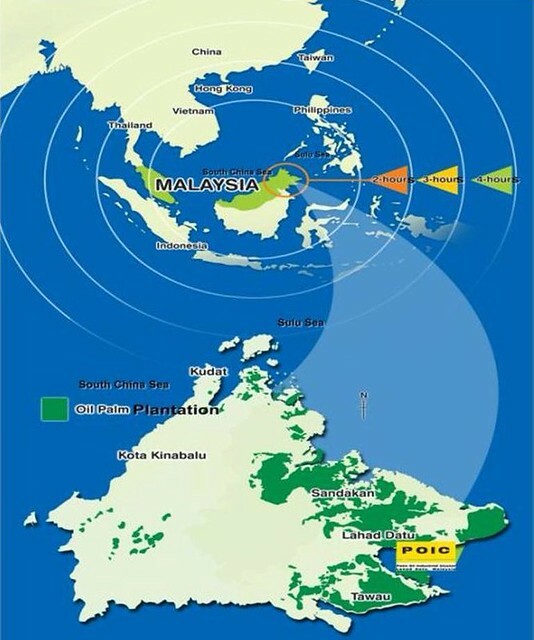 POIC is located in Lahad Datu in the east coast of Sabah. MOU worth RM500 million was signed between POIC Sabah and Evolution Energy, whereby Evolution Energy is expected to acquire some 50 hectares of land at POIC Lahad Datu for 5 plants -- three for the production of liquid biofuels and two for manufacturing the environment-friendly Nucoal, a solid biofuel. These plants are estimated to require up to one million tonnes of biomass, mainly fronds and trunks, annually. Though fronds and trunks are targeted as the main raw materials, it said the facilities were designed to also process empty fruit bunches (EFB - from palm oil mills) and wood wastes from the state's timber industry. Evolution Energy's entry into Sabah came in the wake of the launch last June of the Biomass Joint-Venture (JV) Cluster concept of aggregating EFB from most of the 130 palm oil mills across Sabah. From its 1.4 million hectares of oil palm plantations, Sabah produces about 26 million tonnes of oil palm biomass comprising fronds, trunks, EFB, palm kernel shells and mesocarp fibres. Failure in earlier attempts at securing long-term biomass supply had kept investors at bay. The JV Cluster approach circumvents issues of pricing and supply tenure by bringing in the biomass owners whose capital injections into the proposed downstream JV companies will be in the form of biomass. Evolution Energy is based in North Carolina, US. According to its official handout, 'it pioneers new and innovative energy technologies that address the growing global demand for green power producing facilities'. One of its businesses is the manufacturing of Nucoal, a coal substitute made from biomass that does not threaten the environment.